I have just returned from two conferences these past 2 weeks – the COMMON User’s Group annual U.S. meeting in Orlando, FL., and an IBM sponsored event in Paris specifically for IBM i users. In Paris, I spoke about database revitalization to a room of over 500 IBM i folks, and at both events covered a number of DB2 and DB2 Web Query topics. In the last couple of weeks I have probably presented to over 1000 people! These events, along with others, such as the RPG/DB2 Summit, are a really great way to hear about what IBM is doing to deliver new function across a broad set of IBM i technologies. However, events require travel costs and time, which not everyone has a wealth of! 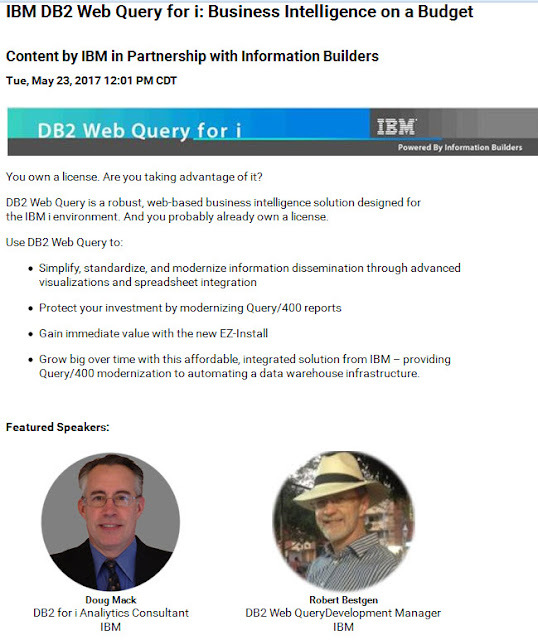 With this in mind, and assuming maybe you didn’t get to an event, I wanted to share with you a SHORT recorded webinar we (Rob Bestgen and I) conducted this week providing an overview of DB2 Web Query for i and details on the new (and very popular it turns out) EZ-Install Package. The hour long webinar will be available for some time and you should check it out! To register for, and listen to the webinar, click here - and ENJOY! Doug Mack leads the Analytics team within the DB2 for i Lab Services group. The broader DB2 for i team consists of highly experienced DB2 for i consultants with a wide range of skills, from performance analysis to database modernization and SQL development, incorporating best practices around database design and ETL/Data warehousing, to DB2 Web Query implementation and skills transfer. Doug and his team has authored many articles and redbooks on IBM i based Business Intelligence and Analytics topics, and Doug continues to be a speaker at many client events and user group meetings across the world. Doug has worked on behalf of IBM since 1980, starting as a development programmer in the Rochester, Mn. Lab, and progressing onto several years as a Systems Engineer in the Pacific Northwest and BI Specialist on the West Coast, to Product Marketing Manager for analytics on Power Systems. Doug currently makes his home in beautiful Olympia, Washington, and can often be found on a soccer pitch in town. Doug can be reached at: mackd@us.ibm.com, or follow him on Twitter @mckdrmoly. The postings on this site solely reflect the personal views of the author and do not necessarily represent the views, positions, strategies or opinions of IBM or IBM management.